This system was interesting to me because it had the best sound of any Thiel speaker system I have heard lo these many years. It was musical, approachable, decent harmonics, not grainy or shouty, and even engaging to a certain degree. I didn’t play our own music here, so their ultimate capabilities are unknown to me, but if I was a Thiel dealer, I would be looking into these speakers (and the new modern-looking Thiel TT3) and picking up D’Agostino gear to play on them very, very seriously [OK, yes, D’Agostino is a wee bit expensive for these speakers, but they really seemed to like each other]. 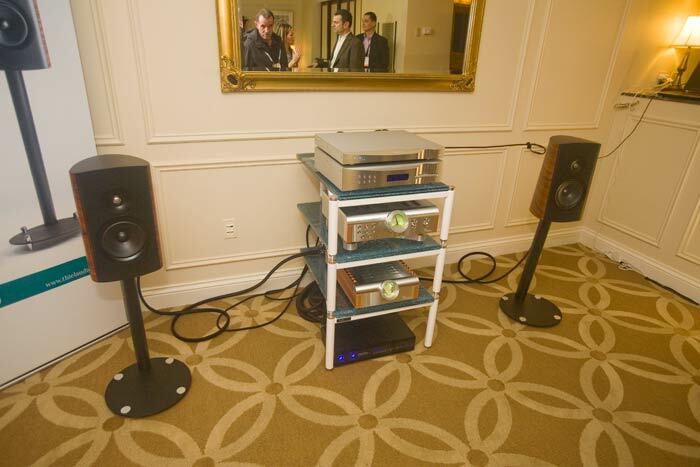 This somewhat startling-looking system sounded pretty darn good. I heard very little boxiness or speaker coloration, so there was good separation, which I am quite partial to. From separation we usually get good imaging and soundstaging, linear-ish dynamics and response. So the performance of this system was up there with the second or third tier of rooms at this show. Not a lot of bass here, but at a show that is often for the best. 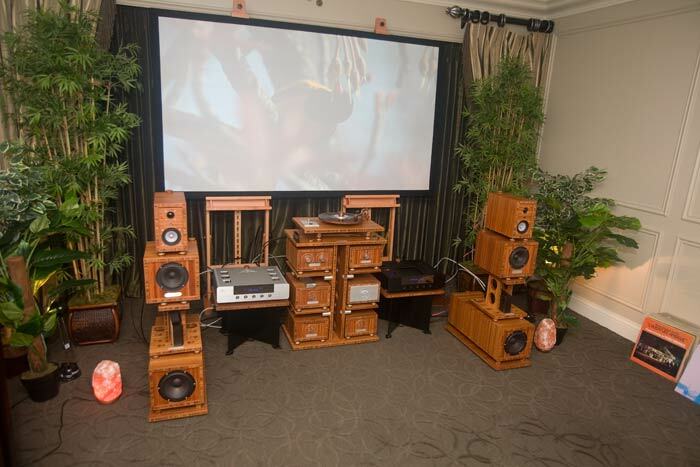 I really just thought this was interesting because, well, if you are someone who really likes the use of natural-looking high-end audio cabinetry, your choices in brands of gear are severely limited. And here we have someone who used just that approach and it worked! It is something well-worth listening to. Astell and Kern is a Korean company that makes, as I understand it, a handheld device with a DAC and discrete component output stage that orchestrates digital playback. In this room they were showing a system with prototypes of their forthcoming speakers, tube amplifier (a solid-state amplifier will also be available), and preamp [and maybe cables too, I forget]. Although they did not play this loud enough for me to get a sense of the overall quality [no, I am too damn overly polite and did not ask them to turn it up. I’ll try to do better in the future], these speakers are by the same designer who built the Metal Design Systems [I think it was called] speakers that showed here several years ago and with which I was extremely impressed [probably still have their brochure here somewhere. I know I saw it here a year ago but sometimes I do have to throw things out when the file cabinet will no longer accept new brochures 😉 I can’t be the only one who collects these things]. So, the fact that they are (1) using this speaker designer who can build speakers with excellent [excellent!] separation and transparency [both attributes a reflection of accuracy for those who shy away from audiophile terminology], and also that they are (2) willing to go the extra mile and build a tube amp for those of us who think tube amps are usually better sounding than solid-state for listening to music, and (3) they are heavily into the modern streaming-music revolution, so they will be offering us the conveniences of same – well, this is a company to watch, IMHO. 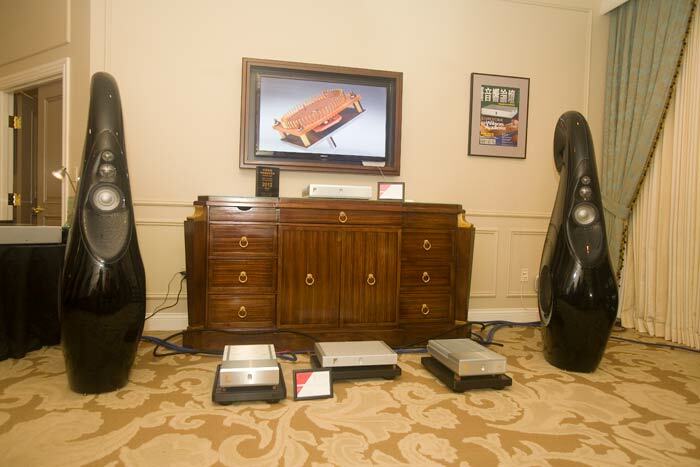 Ayre Acoustics electronics on Vivid Giya G1 speakers. 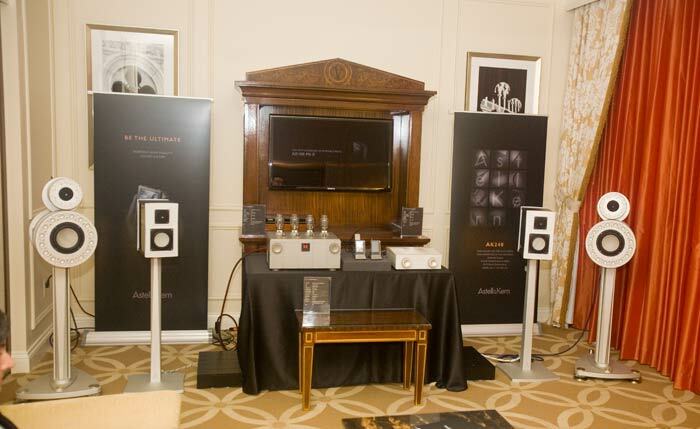 HRS amp stands. Cardas cables. Vivid, a home audio speaker company that deserves a lot more accolades than it gets. 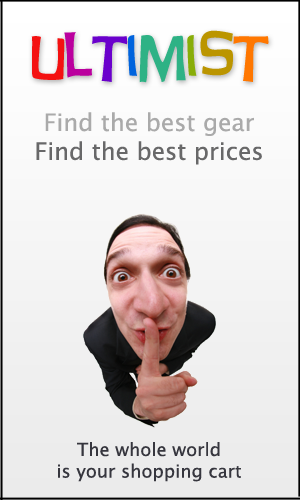 Ayre, an home audio electronics company that… also deserves a lot more accolades than it gets. This system was approachable, enjoyable, somewhat sophisticated, although a little laid back. Essentially, I could actually spend time listening to this over the course of many, many hours and you wouldn’t have to hold a gun to my head. Quietly in the top 10 rooms. Other the years, Ayre is slowly edging out all other solid-state amplifiers in the reasonably priced [or, at least, not outrageously priced] category to my way of thinking. Just enough accuracy, resolution, dynamics, harmonics to keep it all sounding like music. 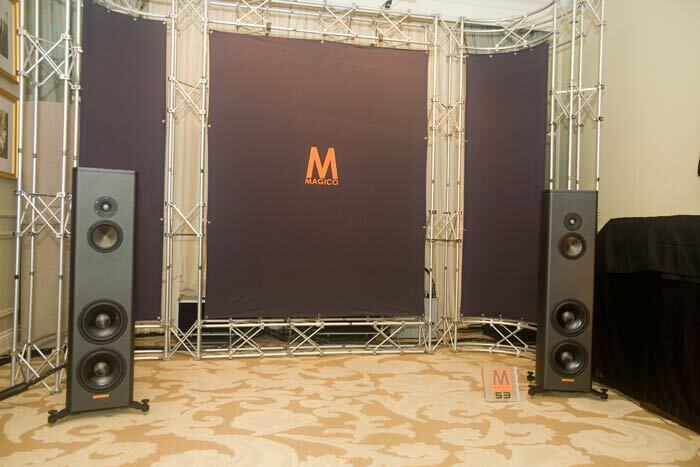 It seems these are new speakers from Magico [who seems to pop them out like … well, like popcorn. Not sure how they do it but I kind of wish they’d stop it. Keeping up with all these puppies is tiring me out], and one can hope that they took the lessons learned from the successful nd smaller S1 speaker [hope they are successful; a very nice speaker at a very nice price] and made these using the same design parameters with just a bit more bass. Hard to tell. Hard to tell. I like that they put these on some well-known electronics. Unfortunately the sound was not very exciting, not quite as tight as what would show these off to be the true bigger brother to the S1 – but this is also often a signature trait of the electronics being used. So… hard to tell. Hard to tell. 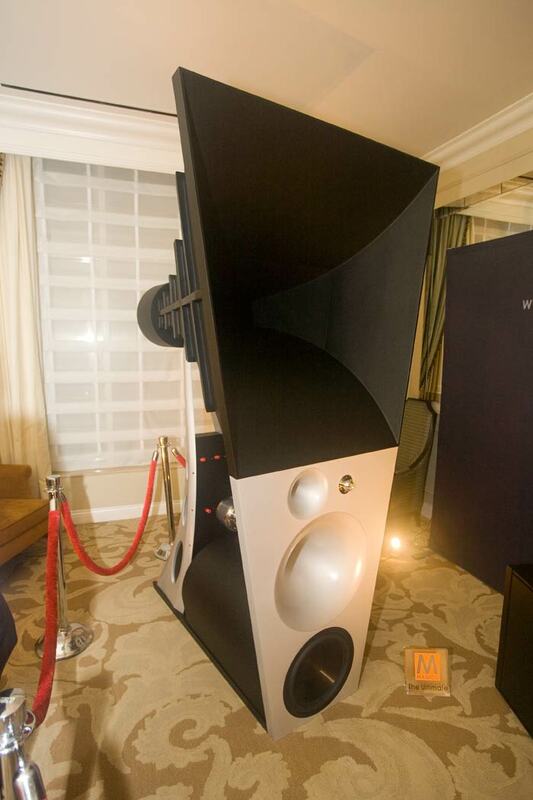 I am sure there will be plenty of reports that regurgitate the specifications of these $600K speakers. So I will just post a few observations. The speakers are solid aluminum [which we were not supposed to touch and I, at least, did not get to touch them. Alon would kill me (again 🙂 )]. But it *looks* like some kind of composite material; the corners are mitered so well, and the paint job so thick and warm-looking, that it is hard to believe it is made of metal. The fit-and-finish here is amazing. We have a few dozen photos of this speaker which we will be posting on Ultimist.